Type: Lithium Polymer. 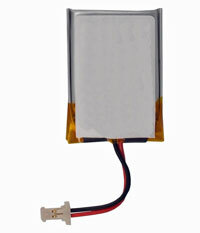 Voltage: 3.7 V.
Width: 21 mm. Height: 32 mm. Thickness: 3.0 mm. Price: £15.99 each. Postage and packing included. Also known as: ATL 302030, IATL 302030, LP302030. Configuration: Protection circuit, red and black flex 20 mm, white two-pin connector. LP302030-PCM-LD This Apple Lithium Polymer PRAM battery is typically marked with IATL or ATL 3.7V 302030 and some batch numbers. Our replacement, the LP302030-PCB-LD, comes equipped with a protection circuit, flex and connector ready for plugging into a slave board. There are two types of Apple PowerBook G4 PRAM slave boards that take this LP302030-PCB-LD Lithium Polymer battery. Take a peep under the slide-off cover as some of these PRAM/USB boards take two coin-cell batteries, a double CGL2430 assembly, instead of this rectangular Li-Po battery. The lithium-Polymer technology used in these LP302030-PCM-LD cells has no 'memory-effect'.